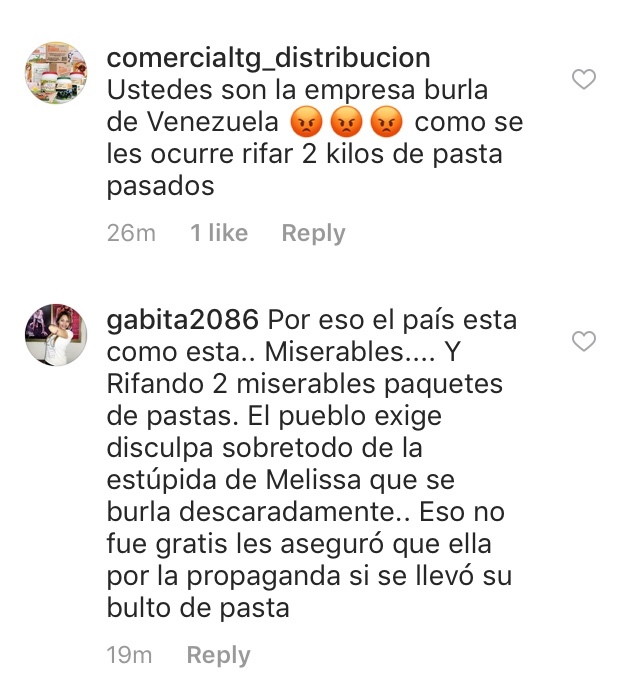 About a week ago the well-known Venezuelan journalist Melisa Rauseo, announced on her profile on Instagram a contest sponsored by the brand of pasta Ronco. At first glance there did not seem to be anything negative: the prize offered was two packages of pasta. However, when the contest became public, the networks began to project a deep rejection against Rauseo and the Ronco brand. Within minutes, what seemed like a routine marketing idea had transformed into a reputation crisis for the journalist and for the Venezuelan company. What had gone wrong in the marketing strategy of Pastas Ronco? What had his influencer failed? For those who are not familiar with the situation of scarcity and hunger lived in the streets of Venezuela, this type of contest involves certain implicit risks. Depending on the tone of the campaign, and the language used, there is a high probability of being perceived, to say the least, as offensive, even when your intentions are the best. Let’s see why. Hunger: during the year 2017 the number of children suffering from malnutrition doubled in the country, which means that 15 out of every 100 children in the country are undernourished. Susana Raffalli, explains that the forecast for 2018 is that the country will remain in a state of emergency. More price controls: during the first week of the year, the National Executive ordered the chains of automercados to sell their products with the prices of the beginning of December 2017. As a result of this, they began to see automercados that only sold fruits and vegetables, corridors and empty shelves, increasing protests over shortages. Shortage: products of the most traditional in Venezuelan cuisine such as rice, beans, pasta, corn flour and wheat flour, have severe production problems. This adds to the decline in food imports, resulting in a higher percentage of shortages. Inflation: Alejandro Werner, head of the International Monetary Fund (IMF) for Latin America, warned that the economy in Venezuela is expected to suffer a 15% collapse and inflation of up to 13,000% this year. On the other hand, the Cendas announced in February that 139 minimum wages were required to acquire the Basic Family Basket (after this study, the National Executive decreed an increase in the minimum wage of 58%). Taking into account this scenario in Venezuela, it is necessary to explain what the contest announced by Ronco was and why it caused them an image crisis. The brand, through the journalist and influencer Melisa Rauseo, offered Instagram users to follow their corporate account, and they mentioned 3 friends, they could choose 2 Kg of spaghetti Ronco. The answer was overwhelming, but obviously unexpected for Ronco. More than 1,400 comments were received in just hours, harshly criticizing this type of contests in a country where the media daily shows children, adults and seniors checking garbage containers in the streets, to find some food. 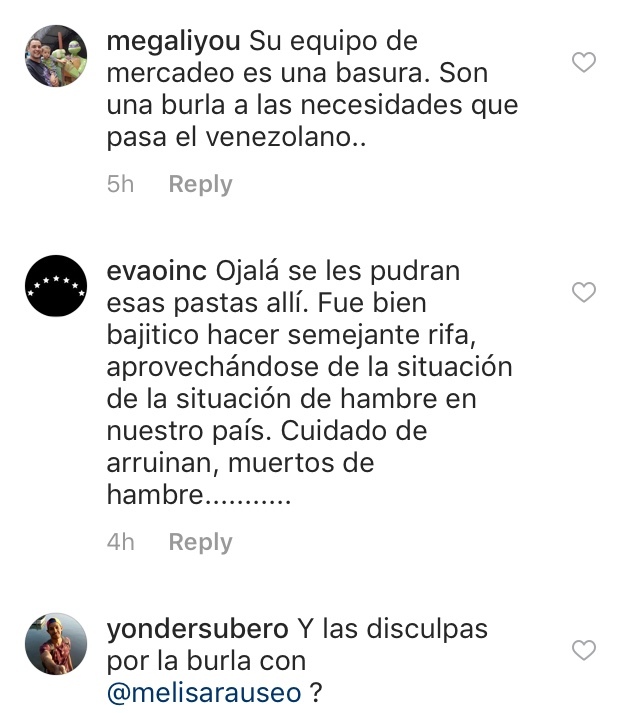 Some messages indicated that Ronco’s offer was degrading, offensive, trivialized a topic as sensitive as hunger, and even insufficient, given the magnitude of the crisis in Venezuela. The contest was eliminated both from the Rauseo account and from any publication that Ronco had made. The decision in the face of the unleashed crisis, both of the company and of the influencer, was silence. To date, a week later, a statement, response or official message has not been issued by any of the parties involved. But the public did not release the subject so easily. In fact, they continued to express their complaints and criticisms in any publication they have made on their social networks, even though they had nothing to do with the contest. Many are the companies that have faced reputational and image crises. Some have managed to manage the crisis well (German Wings case) or mishandling as we could see from Pepsi and United Airlines in 2017. A quick, timely and honest response is the key to smoothing an error of such magnitude. In the case of Ronco, we should start by expressing a formal apology to people who felt offended by their competition. The apology could give context to that initiative, and show empathy with the public. It would also be an opportunity to remember the trajectory of the company, which incidentally has been highly valued by consumers throughout its history in Venezuela. This action could be followed by a continuous information strategy through its social networks and influencers, in which the trajectory of the company in the country, upcoming events and, especially, count all the Corporate Social Responsibility initiatives that have taken finished. Coupled with this, in a scenario like the Venezuelan one, the alliances that the companies of the food sector can have with non-governmental organizations or institutions related to the food attention of individuals in situation of vulnerability take on special value. On the other hand, Ronco offer the public a channel of communication to send comments, criticisms or suggestions, that allow to divert from social networks the volume of negative expressions and attacks, in order to give them closer attention. The way to establish this channel can be diverse, but the most important thing of all is that this action is not only in a mailbox. The brand MUST respond to each one. Under normal conditions this would be a problem in a certain manageable way for any company, but in view of the situation that crosses the country and the sensibility of the Venezuelan at this moment, it is a reputational crisis difficult to manage. However, proactive communication always offers greater possibilities of surviving a crisis, than betting on silence.